February 13th. The eve of one of the more dreaded days of the calendar year. For people who are spoken for, they are preparing to woo their loved one with a fancy, overpriced dinner, with overpriced flowers that will die, and boxes of chocolate that will be half eaten because really only the caramel-filled and milk chocolate pieces matter. Valentine's Day is the time for those lucky enough to have someone to show just how much they care, and for greeting card companies to make enough money to give out bonuses for ski homes. While some are looking forward to this...holiday, some (most?) are dreading it. This being said, I'm here to tell you that things will be okay! I haven't had a Valentine's Day worth celebrating in years, and while I used to get bummed out, I have developed ways to get distracted by it, thus not being bothered by it. Some have worked out okay and some have led to embarrassment, but if you can't laugh at yourself then you can't laugh at anything, or something like that. All that matters is you try. 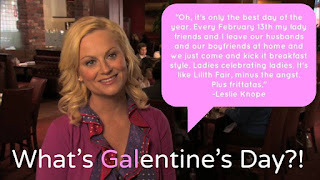 Then, of course, you will see some mention of Leslie Knope discussing Galentine's Day. Everyone thinks their sooooo unique posting the same stuff. To help cope with the Valentine's Day blues, one recommendation is to take a shot for every time you see one of those two gifs show up on various forms of social media. You will get so drunk that you will probably not remember today or Valentine's Day at all, so therefore it never really happened, and you can't have a bad Valentine's Day if it never existed. It's science. 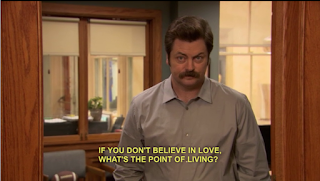 While these gifs and memes don't really help matters, I would like to offer a more uplifting piece of advice from a Parks and Rec character: Ron Swason discussing love, despite being divorced 3 times. I think this is very uplifting, honestly. Never give up! There is no point in giving up. The right side of my phone has a dent on the right side from all the swiping I've been doing over the years, but I'm not giving up! While my batting average is absolutely abysmal, it only takes one correct swipe to make life wonderful. Still hoping this comes from real life and not Bumble but hey it's 2018. I'm still not used to this whole new positive outlook on life that I'm trying out. Writing this makes me feel weird, like when you leave your phone at home and you're at work or something. Last year, I decided that I wasn't gonna mope around the apartment drinking Budweiser and watching a meaningless Bruins game like the year before. I decided to take myself to get some Ramen noodles in Providence, because that's one of my happy places in life. Since this place is popular and small, I showed up early before it opened, signed up on the wait list outside and waited to be called. 10 minutes later when the hostess came out she started calling for the other parties signed up. "John, party of two. Abigail, party of two. Big Sid, party of two. Yolanda, party of two," she called, which suddenly made me realize something. I wasn't a party of two. Another few names and she came to my chicken scratch handwriting on the sheet. 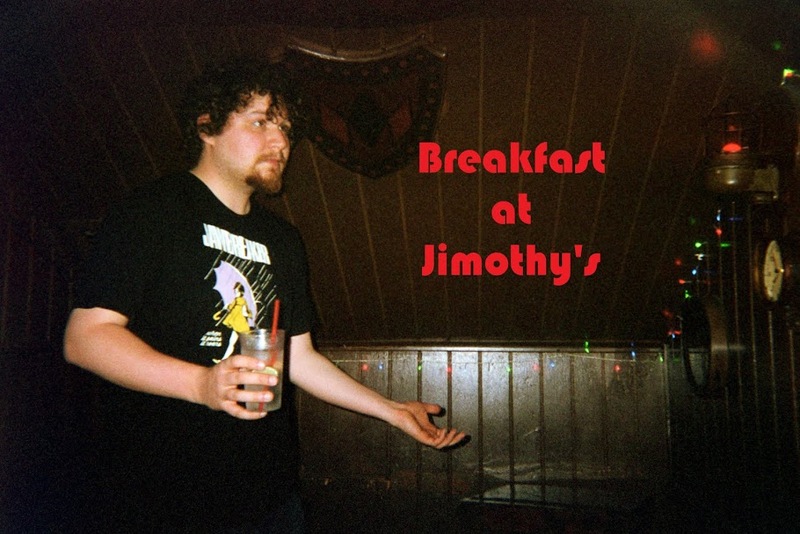 "JIM PARTY OF ONE!" she said. I'm sure she didn't yell it any louder than the other names, but it felt like it. I made my way through the group of people that had swelled up to like, 40, all in pairs, trying to shhhh her to keep it down that I was by myself. Of course, she continued "PARTY OF ONE! JIM! Aw Jim! Aw! I'll be your Valentine!" This, of course, was very mortifying. I was very touched that this girl offered to be my Valentine but I think it may have been her way of saving the tip she had probably thought she had lost by embarrassing me. I had never slurped down a bowl of ramen so quickly. I tipped, by the way. Why did I share this humiliating story with you? To prove to you that no matter what you do to treat yourself this Valentine's Day, it probably can't get much worse than that. I survived! I mean, sure I had to go to a bar afterwards to decompress from sheer embarrassment, but that was one of the better Valentine's Days I've had. Point is, you can survive this just fine. I think if you're single you should try to go on out there, take the bull by the horns and try having some damn fun. 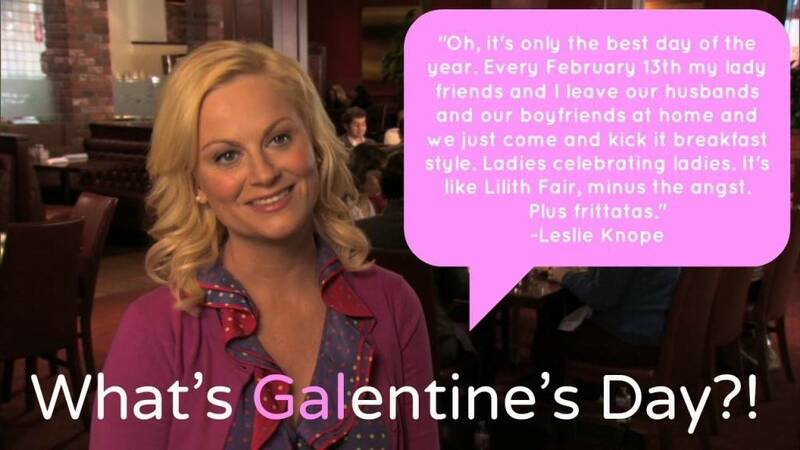 It is perfectly fine to please yourself on Valentine's Day. Self love is the key to happiness. This phrasing is starting to turn a bit more risque then I had intended. How can you love someone else if you don't love yourself, you guys? If you want to go to sewing circle, go to sewing circle. Wanna find a friend and throw bottles at stop signs? Go for it! Feel like drinking at a bar to try to pick someone up while playing Vanessa Carlton songs on a jukebox? Hell yeah, that's what I'll probably be doing! Well, the playing Vanessa Carlton songs on the jukebox part, at least. Also, I'm single. Tell your friends.